Hedging: The Real U.S. Policy Towards China? Is America trying to contain China? No, it could be just hedging its bets. Over the past several years, it has been common practice for Chinese academics and pundits to describe the U.S. “pivot” or “rebalancing” to Asia as part of a greater strategy of containment. Popular Chinese news media like Xinhua, the People’s Daily and the Global Times regularly run articles assuming that the U.S. is enacting a containment strategy as it once did against the Soviet Union during the Cold War. In the contemporary debate among various Chinese scholars and in the media, the pivot is seen as a strategy based on American financial monopoly, or at least one based on the military industrial complex’s need for an opponent. Occasionally some in the U.S. like Bonnie Glaser and Joseph Nye warn the U.S. against a policy of containment, apparently giving credibility to such charges. On the other hand, U.S. policymakers reject the notion of containment. There simply has not been the type of policy realization as famously took place when George Kennan sent his ‘Long Telegram’ to Washington in 1946. Indeed, many in Washington insist that the relationship with China is one of engagement and is highly successful in a number of spheres, including trade, counter-proliferation, and global governance. Voting patterns in fora like the UN Security Council show closer U.S.-Chinese positioning than would be expected. So the question remains concerning how to understand the disconnect between the two perspectives. Such opposing viewpoints can be explained if one assumes that the U.S. has been enacting a much more nuanced policy than simple containment. 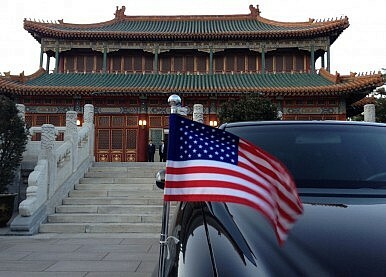 Rather, the U.S. is enacting a policy of hedging towards China. In fact, many states in the region (such as Japan, Singapore, Vietnam and the Philippines) have policies towards China that could be characterized as hedging. Appropriated from the financial world, the basic assumption is that hedging means a state spreads its risk by pursuing two opposite policies towards another state. In international relations, states carry out two contradictory policy directions simultaneously: balancing and engagement. A state prepares for the worst by balancing – maintaining a strong military, building and strengthening alliances – while also preparing for the best and engaging – building trade networks, increasing diplomatic links, and creating binding multilateral frameworks. U.S. behavior towards China easily fits into both of these extremes. Why have U.S. policymakers and a number of their Asian peers decided to pursue such a policy towards Beijing? In essence, it comes from uncertainty. It is difficult to develop policy without strong knowledge of what the other state intends. While this uncertainty exists at some level between all states, diplomatic custom, international government organizations, and multilateral rule systems (like the WTO) minimize this uncertainty by imparting predictability to state-to-state relations. This predictability is enhanced by diplomacy, transparency, and on occasion, espionage. So what is different concerning China that provokes the urge to hedge? First, China is clearly a rising power. Beijing’s unfinished rise means that no one yet knows – including China itself – its true potential and ability to project power. This uncertainty could be described as structural: it has to do with power and the perception of how much power and influence Beijing will eventually have. Second, no one knows how China will use its growing clout. Indeed, over the duration of the South and East China Sea crises, regional players have been trying to gauge Chinese willingness to use force to pursue its claims. No one knows how far Beijing is willing to go. Thirdly, China’s regime type makes it a particularly difficult state to read; its foreign policy-making system is comparatively opaque. Contrast this with the United States, where foreign diplomats can access U.S. policy intentions by spending time in Congress, visiting think tanks, reading free media, and so on. Clearly the utilization of a hedging strategy demonstrates that U.S. policymakers are undecided on whether China constitutes a threat. Hedging is not simply defined by a state’s actions, but by its intentions. In May 1941, although Germany’s relationship with the USSR looked like hedging, it was not. While Germany was enacting two opposing policies of balancing and engagement with the Soviet Union, it had in fact already decided on war in November 1940. This illustrates a crucial difference between U.S.-China relations and German-Soviet relations: U.S. policymakers are genuinely uncertain which line to pursue. In a situation when a state is hedging against another state, what is the optimum policy reaction for the latter? One advantage of the hedging discourse over a containment discourse is that Chinese leaders need not take the defensive. They can attempt to persuade the U.S. and regional powers of China’s benign intentions through a re-engagement of China’s 1990s soft diplomacy. Beijing could begin by shelving or de-prioritizing a number of territorial issues. The Chinese leadership might opt for trust-building through new institutions and customs while resurrecting neglected ones, such as the Military Maritime Consultative Agreement. If Chinese leaders were to accede to a Code of Conduct in the South China Sea, or utilize conflict resolution mechanisms such as the International Tribunal for the Law of the Sea (ITLOS), it might go a long way to dampen the hedging policies of regional states. If the Chinese People’s Liberation Army (PLA) were to continue its tradition of issuing White Papers with ever-increasing transparency, it would also go a long way to calming regional fears. In order to mitigate a hedging strategy, one must only address the causes of uncertainty in the relationship. Some of those are structural and difficult to address, but others are well within the reach of policymakers in Beijing. John Hemmings is a non-resident SPF Fellow at Pacific Forum CSIS and a doctoral candidate at the London School of Economics.